14-15 February: the action outside FSB headquarters, Chelyabinsk. Source: Popular Self-Defence group / VKonktate. In late January, news that Viktor Filinkov, a left-wing activist and computer programmer, had disappeared (24 January) at St Petersburg’s Pulkovo airport was followed by arrests and searches (26 January) at the apartments of anti-fascist activists in the city. When Filinkov then surfaced in court and pre-trial detention, he stated he had been tortured by officers of Russia’s Federal Security Service (FSB) – as did a witness in the case, Ilya Kapustin. Another Petersburg anti-fascist, Igor Shishkin, also disappeared after his apartment was searched. As it later became known, the Penza branch of the FSB opened an investigation into a “terrorist organisation” (Section Two of Article 205.4 of Russia’s Criminal Code) in October 2017 – and are charging six people in this case, some of whom have been tortured. The news of the “Penza-Petersburg” case has understandably stirred Russian activist circles, leading to a series of public pickets against FSB torture. 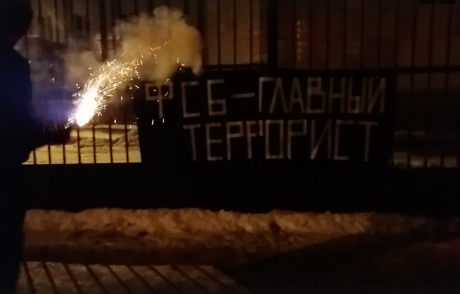 On the night of 14 February, a banner reading “FSB is the main terrorist” appeared on the fence of the Federal Security Service building in Chelyabinsk. “In solidarity with repressed anarchists across the country, we paid a visit to the FSB in Chelyabinsk,” - this is how the action’s organisers explained their slogan in support of detainees in the Penza-Petersburg anarchist case. In this video, you can make out three figures in black hanging up the banner, after which one of them lights a flare and throws it over the fence around the FSB building. At roughly 10pm on 19 February, FSB officers detained two anarchists in different districts of Chelyabinsk, Dmitry Tsibukovsky and Dmitry Semenov. The latter is known for coordinating assistance for Ukrainian anti-fascist Oleksandr Kolchenko, who was sentenced together with Oleg Sentsov in the “Crimean Terrorists” case. At the same time, FSB officers visited the home of Semenov’s first cousin Maxim Anfalov, as well as a common friend and hitchhiker by the name of Maxim. The action outside Chelyabinsk FSB headquarters on 14-15 February. The men and women later detained and tortured in connection with this action were not involved in it. The brothers were talking to each other on Skype when FSB officers simultaneously knocked on their door. Anfalov recalls that the officers initially did not introduce themselves, saying that they were collecting signatures in support of returning the “against all” option on ballot papers. According to Tsibukovsky, men in masks and uniforms with FSB insignia detained him at Chelyabinsk Tube-Rolling Plant, where he works: “They pushed me to the ground, pushed my hands painfully behind my back and handcuffed me, though I didn’t resist. After this, the uniformed officers punched me no less than ten times in the torso, head and neck. They beat me with the base of their hand against the soft parts of my body, neck, and clipped me round the back of the head.” Without drawing up a report, the officers confiscated Tsibukovsky’s mobile phone at work, and he was taken for a search of his apartment, which he rents together with his friend Anastasia Safonova. After the apartment searches, all four men were taken to the FSB building, where, as they report here, they were forced to confess that they hung the banner outside the building. A “hooliganism” investigation (Article 213, Part 1) was opened into the incident. Tsibukovsky and Anfalov state that they were beaten and tortured with a taser in the FSB building – as a result, Tsibukovsky signed a confession, naming himself as organiser of the action. Anfalov, who insisted that he was visiting his hitchhiker acquaintance Maxim in Kopeisk with his cousin, remains a witness in the case. According to Semenov, he was not tortured with the taser, but was forced to hold a painful position throughout the night. “The handcuffs cut into my hands, I spent a lot of time in a half-squat, practically the whole night, I don’t remember exactly. I got hit round the head once, they were demanding I confess that it was me who hung up the banner,” Semenov recalls. Anastasia Safonova was not treated violently, but, as Tsibukovsky remembers, the officers let her hear his shouts during torture. By the morning, when the detainees had been brought to a central district police station, the FSB had started to threaten Semenov with torture. “They brought in some kind of machine, they said that it was a taser of some sort, they strapped me to a chair and said that this was my last chance to write a confession, but I still didn’t write it,” Semenov says. He believes that it was the arrival of a lawyer that saved him. It is unclear what happened to the hitchhiker Maxim. Semenov says that he heard his cries in the FSB building, but after release has been unable to contact him. In the end, the detainees have all been released. Tsibukovsky, Semenov and Safonova are being treated as suspects in the hooliganism investigation, and have now signed statements to the effect that they won’t leave the country. Anfalov (and, it seems, the hitchhiker Maxim) is a witness in the case. Maxim Anfalov and Dmitry Tsibukovsky plan to make statements regarding torture to Russia’s Investigative Committee. MediaZona publishes their stories about the searches and interrogations here. They rang the door to my apartment, they said they were collecting signatures in support of returning the “against all” option at the elections. I didn’t open the door. Then they started banging the door and shouting that I open it, because they’re officers from the FSB. They said that if I didn’t open the door, they were going to break the door down – which, indeed, they started doing 30 seconds later. It was terrifying, I didn’t know why they were here, and answered only “open up and you’ll find out” to all my questions. In the end, I opened the door and was instantly pushed to the ground. They were saying that I knew why they were here. They also said that they have an order to search my apartment, but showed it to me 20 minutes later, when I was already on the floor in handcuffs. After they pushed me to the ground, they took my phone and began looking at it. They found my VKontakte page, and started asking about the “Popular Self-defence” group [where the video of the banner action first appeared] or something like that, I don’t remember the exact name of it. Their questions were accompanied by shocks from the taser. Then they started asking questions about where I was from 14-15 February. They tried to convince me that I was in the centre of town, and I started to say that I didn’t remember where I was exactly. It was hard to remember anything in that kind of situation. I can’t remember their faces, three of them were wearing masks. One of them was the one that beat me. They beat me with the taser in the lower back, on the legs, on the hands – it felt as if they were pressing something very hot [against me]. The worst was when they used the taser on my hands in the handcuffs, it was very painful, and because of how I moved as a result, the handcuffs also hurt me. After they stopped torturing me, they showed me a video from my own phone, in which three people hang a banner saying “The FSB is the main terrorist”. And then one of them throws a smoke grenade or something over the fence. They asked if I recognised anything, I answered the truth: that I still couldn’t understand what I had to do with all of this. Then they started searching the apartment. There were witnesses, I don’t know where they got them from – they weren’t from my building. The search lasted an hour or two, they took two coats (I wore one of them), jeans, two hats, two laptops (mine and my girlfriend’s), all the telephones (mine and my girlfriend’s), five of them, two USB sticks, four sim cards, all charging devices. They even took a broken memory card for one of the phones. They filmed the search on a phone. They found my airsoft gun, put it in my hands and photographed me. It seemed like they did it for a joke, but who knows. They pointed out that I was not in a good situation and that it was better not to ask stupid questions, and then let me sign the search report. I read the report and then understood why they were there – but why they’d come to me, someone who isn’t involved in activism whatsoever, I don’t know. Then they took the witnesses home, I sat in the car with my head down. One of them spoke to me in the car, he said that I had the right to remain silent, but whether I’ll survive what comes next… They threatened to ruin my girlfriend’s life. Or my mum’s. Then they brought me somewhere – the only thing I saw was the tile floor, they wouldn’t let me raise my head. The officers took me into a room with a table, couch and cupboard. They put me on my knees facing the cupboard. They started asking what I knew. In the car, I’d remembered that on that day [14 February] I’d gone with my cousin to see a hitchhiker, Maxim, who was renting a flat in Kopeisk [a nearby town]. They said that I was just lying and started torturing me again. At the start, they hit me with the taser: arms, legs, shoulder, back. The worst was when they hit my hands – they ordered me to hold the taser with both hands and then turned it on. It was very painful. As I understood, they wanted me to say that I knew the organisers of the action [outside Chelyabinsk FSB]. Or that I’d been involved. But neither of these were the truth, and I didn’t say anything. I repeated that I’d been with my cousin in Kopeisk at a friend’s house on the 15th. After the next round of torture and questions, they told me to stand with my legs half-bent, otherwise they’d hit me with the taser again. I stood like that for 10-20 minutes, I couldn’t do any more than that. Then they said do 100 squats, which I did. It was very painful. It was hot, and they didn’t let me drink. When I told them I was about to faint, they took me out of the room and let me sit down. In the end, they weren’t satisfied with what I said – that I’d been in Kopeisk together with my cousin. They forced me to write that I’d been there without my cousin. They accepted this, and then after a few hours of standing by the wall, they took me to the police station, it was morning then. There [in the Central District police station] they questioned me for a long time as a witness, but I said basically the same thing. Then they just kept me there for a very long time, they let me go around four o’clock. My mum was waiting for me outside – my brother’s lawyer had found us, it seems. The following is from Dmitry Tsibukovsky’s statement to the Investigative Committee. They took me into my apartment, put me face-down on the ground and started conducting a search. I was lying with my face on the floor and didn’t see what was happening. They searched the apartment, and forced me and my girlfriend to sign the search report. They confiscated all my devices, phones, bank cards and other stuff, without an expert present. After the search, they took me – as I later understood – to the FSB building. They took me into the lift and said they were taking me to the fifth floor. There, I could remember the layout of the offices. They took me into an office at the end of the corridor on the right. There was around seven people in the office. Some of them I can identify. One of them was wearing a uniform and mask over his face. The rest of them were in civilian clothes. They kept me there illegally overnight, without conducting any investigation. They didn’t let me sleep, eat, drink or use the toilet. They started demanding a confession about how I’d conducted an action outside the FSB, I refused. They did not remove the handcuffs, and placed me in an uncomfortable physical position, a half-squat. I spent a lot of time in that position, I started getting pins and needles. When I tried to change my position, two officers would beat me. They beat me to make sure they didn’t leave marks on my body, but I still felt physical pain. Those two officers, I can identify them, beat me more than 10 times around the head, neck, body, thighs. All this time they were trying to force me to confess. They threatened me that if I didn’t start talking and confess, then it would be worse for me – that is, more painful. They threatened that they’d put me away for a long sentence. They threatened to use violence against my girlfriend [Anastasia] Safonova. After I didn’t confess for a long time, one of the two officers who’d beaten me started tasering me. He tasered me more than five times in the leg, around my thigh. After each shock, he asked me if I’d made up my mind to speak. The pain from the electrocution was unbearable, and I decided to “confess”, give the evidence that the officers wanted, incriminate myself and others. For me, the main thing at that moment, in that situation, was to come out alive. These same officers discussed with me what I should say and who I should incriminate. They said to me directly that I should indicate Safonova and Semenov. They promised that after this they’d release me and my girlfriend. They took me into another office where an officer, who also didn’t introduce himself, wrote up my interrogation. This officer had been in the office before, when they were beating me. During the questioning, the officer himself drew up testimony and asked me to sign it. This document stated that I, together with Semenov and Safonova, had hung up the banner outside the FSB building. From what the officers said, I understood that a fourth person had been involved in the action. The officers said that I should name them another person, just anybody. Seeing as I didn’t take part in the action, didn’t know its participants, I just named the first person who came into my head – Ilya, who I just made up. During the questioning, I was allowed to speak with Safonova, who was in the next room, on their internal telephone. They told me that I needed to convince her to confirm my words and then they’d let us both go. I asked Safonova to confirm my testimony, that is, sign the testimony. I told her that they’d tortured me and if she didn’t agree to help me, then they’d torture me even more. After that, they continued to detain me illegally, without compiling an official report, for the whole night. The officers told me that if I told my state-appointed lawyer about the torture, change my testimony or even chose my own lawyer, then they’d arrest me, and then they’d torture me even worse in jail. On the morning of 20 February, they took me to the Central District police station, where I remained under guard until 8.30pm – also without sleep, food and water. I didn’t tell the state-appointed lawyer about the torture, as I was afraid of the threats from the FSB. Even more, at the police station, an investigator confirmed that if I didn’t confess my guilt or I revoked my testimony, they’d arrest me and send me to pre-trial investigation prison. That’s why I just told them everything the FSB officers told me and written down in their report. At that moment, it was important just to be released, so that I could then get a decision on my innocence. When I was released without any forms of communication, I first slept, as I hadn’t slept for two days, and then I went to Regional Clinical Hospital No.2 to get medical care, as I was experiencing physical pain in my whole body after the torture. At the hospital, they wrote down a few of my injuries in a report – I link this to the fact that they tried to not leave any traces when they beat me. All the same, a doctor indicated that I had injuries to my stomach wall as well bruises from tasering on my thigh. I request you to bring a criminal prosecution against the FSB officers.